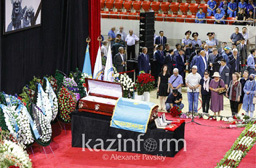 ALMATY (KazInform) — The national funeral service for Denis Ten has begun in Almaty, Kazinform correspondent reports. From early morning, hundreds of people came to say farewell to the famous skater. On July 19 in Almaty, Denis Ten was attacked and stabbed by two men who tried to steal mirrors from his car. Because of his wounds in the thigh, Denis lost 3 litres of blood. He subsequently died at the hospital. Kazakh President has ordered Prosecutor General Kairat Kozhamzharov and Interior Minister Kalmukhanbet Kasymov to take under special control the case involving the murder of Denis Ten, a figure skater who won bronze at the Sochi Olympics, the presidential press service said on Friday. At his funeral at the Baluan Sholak Sports Palace, people gathered to say farewell to the whole country’s beloved. Almaty citizens are carrying flowers, portraits, and expressing condolences to the family and friends of the native athlete. Famous Kazakh boxer Gennady Golovkin also came there from the U.S. to attend the funeral. Minister of Culture and Sport Arystanbek Mukhamediuly read out the telegram of condolences to the parents of Denis Ten from President of Kazakhstan Nursultan Nazarbayev,.